Vertical shaft furnace 60 Tons with charging system. Furnace equipped with 16 burners down plus one main, using natural gas. Automatic flow control. 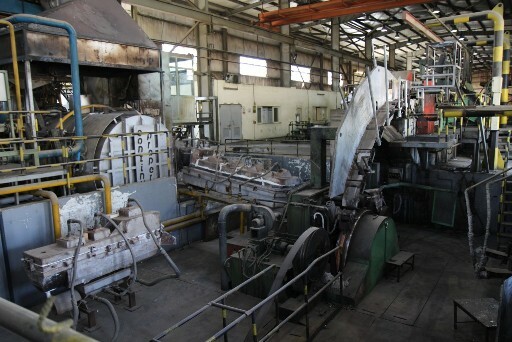 The total height below chimney is 12.5 m and charging level is 10.6 m H. Internal diameter is 3.5 m.
Horizontal holding furnace 16 T, tilt table, for getting stabilized molten copper quality. Tundish and launder, gas heated. Casting wheel 2.3 m, bar produced 50 x 70 x 46 mm H about (2730 mmÂ²). Automatic pouring system, with remote camera control/regulation. Soot coating (acetylene/O2 burning with flow & pressure control). Brush cleaning. DC motor drive 60 kW. H2O cooling about 55/75 kW. Spare bands available. Water flow control and doubled circuits. Spare wheel available. Bar shaving head, 2 angles, with chips evacuation. 50 bar emulsion cleaning box with 2 high pressure pumps. Pyrometer for bar Temp monitoring. 3-stand Roughing mill Type L73 with motorized entry pinch roll. 3 stands: 2 H stand vertical axis, i=300, 2 H stand horizontal axis u=300, 2 H stand vertical axis, I = 300 (Oval â€“ Round â€“ Oval). Independent motor drive 3 x 67 kW. Gap between rolls can be mechanically adjusted. Equipped with gear lubrication system with heat exchanger, pumps and tank (2 pumps). Finishing mill 8 stands, type 9/8 mini. Single motor SIEMENS 352 kW. 8 stands with 3 x 120Â° rollers. Suitable for 8 mm copper rod with 8 stands and 10,5 or 12,5 mm by using 6 stands. Equipped with gear lubrication system for finishing mill. 2 pumps, heat exchanger. Available with one spare cartridge for ghost preparation and available with many rollers. Emulsion system for mills. Pump, filter and heat exchanger. 2 pumps system for safe operation. 4 Ton coiler, automatic change. 3 motors: one for pinch rolls, one for loop, one for basket rotation. Control technique drives. Special AC room with all electrical panel with Contrrol Technique drives and Siemes PLC S7 system. Operator control box, with color screen, touch screen, for whole line operation. Building is 122 m long x 26 m wide today. Machine takes about 70 m in this building.